There are countless electronic sequencer apps available for your mobile device, but based on the popularity of Teenage Engineering’s tiny Pocket Operator synths, people still like pushing real made-of-matter buttons. That’s why the company is now introducing three new models with its PO-20 series. All three new models will still sell for $59, and include the same base features as the original models, including a 16-step sequencer with 16 different patterns, a retro, monochrome animated LCD display, parameter locks, and a headphone jack. TE estimates you’ll get an impressive two-month battery life on a pair of AAA batteries. The new PO-20 Arcade adds synthesized 8-bit arcade sounds reminiscent of your favorite ‘80s video game console, so you don’t need to hack apart your beloved Game Boy to start producing some catchy chiptunes. The PO-24 Office comes packed full of sounds sampled from the average ‘80s-era workplace including disk drives and dot-matrix printers. The sounds it produces might be more recognizable by your parents who toiled away on classic Apple IIs or IBM PCs, but the PO-24 will still appeal to anyone with an appreciation for retro gear. 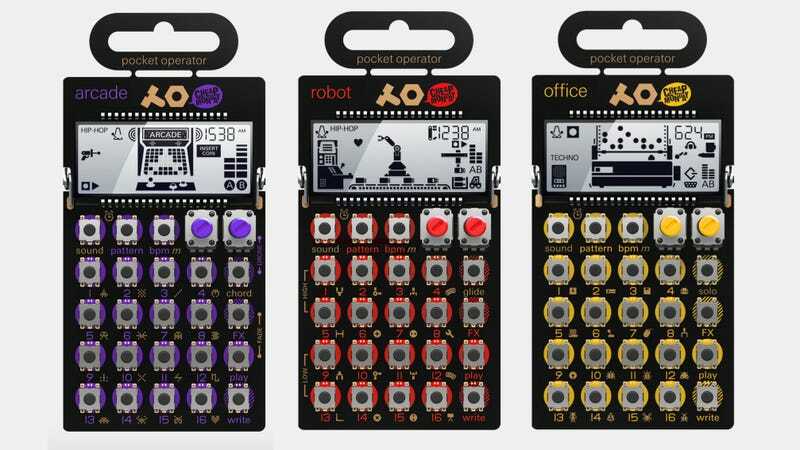 Finally there’ the PO-28 Robot which can be used for creating sequenced blip-bloop tunes, but actually seems more designed for live performances thanks to 8-bit synthesizer engines and the introduction of a glide button for creating smooth transitions between notes. The new models each sound just as capable as the original Pocket Operators were on their own, with just a little more whimsy this time around. Put all three of the new PO-20 series together and you’ve got the start of the next great chiptunes band. There have been other chiptune bands, right?